Daleks – Invasion of Earth 2150 A.D.
Star Wars Galaxies with Yivvits and MrBubble! 00:00 – Intro and theme tune. 02:20 — The Matrix: Back from the dead? 05:53 — Game of Thrones: Start date for season 7. 15:07 – The Lego Batman Movie. 29:11 – A very long ’30 second’ recommendation. 30:05 – A bit of Bernard Cribbins. 32:52 – Peter Cushing IS The Doctor – and jolly nice he is too. 56:44 – Hello to the latex one. 58:01 – Emails and listener feedback. 67:10 – Farewell for this podcast! 68:11 — End theme, disclaimer, copyright, etc. Staggering Stories: Podcast Drinking Game, Fifth edition. Wikipedia: The Lego Batman Movie. Wikipedia: Daleks – Invasion Earth: 2150 A.D..
Stitcher: Smartphone podcast streaming app. 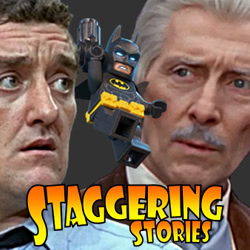 This entry was posted on Sunday, March 26th, 2017 at 10:00 and is filed under Daleks - Invasion of Earth 2150 A.D., Doctor Who, Film, podcast, review, Sci-Fi, staggering stories, Staggering Stories Podcast, Staggering Stories Regular Podcast, The Lego Batman Movie, tv. You can follow any responses to this entry through the RSS 2.0 feed. You can leave a response, or trackback from your own site. © 2019 the Stagggering Stories Team. All Rights Reserved.